Villa Bolina is a delightful 5 bedroom property right in the heart of Areias de Sao Joao and ideally positioned just 5 minutes' walk to the strip and the centre of Praia D'Oura with an array of restaurants, bars and shops. 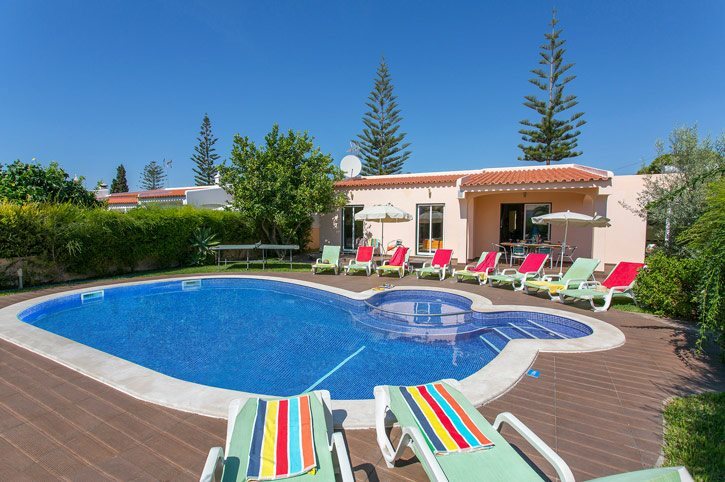 What's more it's just 15 minutes' walk to both Praia D'Oura and Forte Sao Joao beaches. This villa has a private pool with a spacious terrace and homely interiors. Pool heating, WiFi and air conditioning/heating in the bedrooms and lounge are included. A prime location for a lively holiday with the bars, shops and restaurants along the strip all within a short walk. There is a good size pool with an expansive decked sun terrace where you can sit back and relax with a cool drink. The covered terrace complete with a table and chairs plus the brick BBQ adjacent are perfect for alfresco dining in respite from the sun. There is also a poolside shower for your convenience. There is ample room to park if you do decide to hire a car inside the entrance gate to the villa. From the front door, the hallway takes you through to the open plan living area. The lounge, dining area and kitchen are combined. There's a comfortable seating area, a dining table with chairs, as well as a bright and contemporary fully equipped kitchen. Off the kitchen there's a utility room. There are 2 twin bedrooms with en suite shower rooms at the front of the villa. At the back of the villa are 2 further twin bedrooms, one of which has an en suite bathroom, and 1 double bedroom. These bedrooms all have patio doors leading to the pool area. All bedrooms are homely and bright with plenty of storage space. There are 2 separate shower rooms. This villa has applied for a licence and the submission number is 450.10.33/2016/240. The licence number will follow. This villa is in a residential road in Areias Sao Joao, close to the Praia D'Oura Strip where there is a huge choice of shops, bars, restaurants and nightlife on offer. It is perfect for anyone wanting lots to do and a lively atmosphere! Praia D'Oura and Forte Sao Joao beaches are both around 15 minutes' walk away. What's more Albufeira Marina as well the old town can be reached in under 10 minutes' drive. There are plenty of shops within walking distance of Villa Bolina. Plus, there is a local market every Tuesday between Praia D'Oura and the old town of Albufeira. The old town is ideal if you want to experience an authentic taste of Portugal, with narrow streets, handicraft shops and traditional Algarvean colours on display. There are wide shopping streets and a lively atmosphere particularly in the large redesigned and repaved square with live music featuring at times. You're only 5 minutes' walk from the huge choice of bars and restaurants along the strip. Praia D'Oura also has a thriving nightlife scene with a choice of clubs and bars staying open until the early hours in high season, often with live music. For a change of scene there are plenty of restaurants serving a variety of cuisines in the old town of Albufeira. There are 2 beaches within ¾ mile of Villa Bolina - Praia D'Oura's Golden Mile Beach is at the very end of the strip or there's the quieter Forte Sao Joao. Alternatively, the neighbouring resort of Albufeira has a beautiful and expansive sandy beach, flanked by dramatic cliffs and rock formations. For more relaxing surroundings a string of picturesque cove beaches can be found just to the west of Albufeira, including Coelho, Castelo and Gale. And within a 20 minute drive away, on either side of Albufeira, you can spend time at the sandy stretches of Praia Grande to the west and Falesia to the east. For a fun filled day out, a choice of water-slide parks and the Zoomarine aquarium and dolphin show are within a 20 minute drive. Visit the nearby resorts of Olhos D'Agua or the stylish area of Vilamoura which has a fantastic international marina, casino, shops and restaurants. For golfers, the 9 hole Sheraton Pine Cliffs course is nearby at Olhos D'Agua, or for a wider choice of courses try Vilamoura only 25 minutes away by car. Don't forget your clubs! Parque Aventura adventure park makes for a great day out, situated in Santa Eulalia, Albufeira. It comprises of a paintball centre and various adventure courses through the trees made up of zip wires, bridges and ropes. The assault courses and games are suitable for children of 4 years and older with varying degrees of height and difficulty. Villa Bolina is not available to book for season as it is sold out. Take a look here at the Algarve villas that are currently on sale. For American-style bowling visit Praia da Rocha Bowling Alley, located just off the sea front near Hotel Jupiter. Another great Family holiday with Villa Plus. Villa Bolina is lovely. All on one level, so really good for Nana, Grandad and baby too ! Plenty of shower and bathrooms for everybody. Lovely pool with benefit of baby pool attached. Great time, thanks. See you next year! The villa was completely as described and seen on the website. It had everything we needed for our stay and was very clean and tidy.